What a treat to open my email this morning and see my very own book featured on your blog today, Janet!! I’ve been subscribing for quite awhile now, and enjoy reading your posts every day even though I don’t always comment. 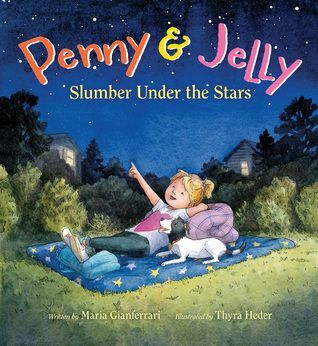 Thank you so much for featuring Penny & Jelly Slumber Under the Stars :)!! Thanks for the invitation…I’ve recently moved to Longmeadow, and I’m going to be away on Sunday. Let me know if you’re ever in western Mass! I recall that you had recently moved, but didn’t realize it was to Longmeadow. I definitely will :).